I am riding motorcycles since 1982 and I have had several jackets during thousands of miles. Last year I bought my Harley, therefore a appropriate leather jacket was necessary. Because of the good quality of the roll bag I bought from Fox Creek Leather I ordered my jacket there. It arrived very fast (3 days to Germany), fits like a glove and is of extraordinary quality. I should have bought one 20 years ago, it would have saved a lot of money; I have no doubt it will last a lifetime! Thank you very much, I am very keen to receive my gloves I ordered last week! Save as much as $300 on Fox Creek Leather Clearance gear and 20% on Select Dress Jackets! All Made in USA – Same Lifetime Guarantee. These may be special orders or the last of a style, and we need the space. From Men’s & Women’s Jackets to Vests, Chaps & Gloves, you can save anywhere from $20 to $300. Because these are clearance items, many are one-of-a-kind or available in limited sizes. Once they’re gone, they are gone. All Clearance Sale items are returnable; however, the customer is responsible for all return shipping fees. Due to the drastic reduction of these items there will be a 20% restocking fee on any returned Clearance Sale items. *Sale prices valid on new orders for in-stock items only. Sales will be terminated at our discretion depending on inventory levels. Sorry we cannot apply sale pricing to backorders, previous orders, special orders, other discounts or out of stock sizes. Occasionally orders come in so quickly that sold out options still show up as available. Some sale items may not be available in all sizes. Prices shown on web page reflect sale prices. Riders Readers fold up and slide into a protective leather pouch that clips to your belt, pocket or whatever you like. These even fit nicely into our smallest handlebar and tool bags. Now extending Free Shipping no minimum order to include Alaska, Hawaii and Puerto Rico. All you need to do is place an order on-line at foxcreekleather.com or by phone at 1-800-766-4165 or 1-276-773-3131, and your gear will ship to the U.S. via UPS or USPS (our choice), so please be sure to include both a mailing address and a physical address when placing your order. *Free Standard Shipping applies to orders for products delivered to the 50 States, Washington D.C. and Puerto Rico. Carrier may be either UPS or USPS. Expedited/alternate shipping available at additional cost. Well, it’s time to announce the winner of the Newsletter Subscriber $250 Gift Certificate and the Newsletter Author $500 Gift Certificate. Once a quarter, we have a random drawing for a $250 Gift Certificate. All you need to do to be in the running for this certificate is subscribe to our newsletter. 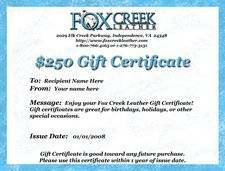 So, not only do you get info about new products and upcoming sales, you have a chance to win $250 of Fox Creek Leather gear. Jeff K. of Charlotte, NC is our newest quarterly winner. The $500 Author’s Gift Certificate is a little more involved. First, you need to send us a story about a motorcycle trip or event with your Fox Creek Leather gear. If your story is featured in the newsletter, you will be entered into a random drawing for an annual $500 Gift Certificate. This is a random drawing in January for the previous year. Hugh of Northampton, MA is the 2013 winner. Congratulations to Jeff & Hugh! Would you like to have a shot at the $500 Gift Certificate? All you need to do is submit a story of 250 – 600 words and include plenty of pictures. If we use it in a newsletter, you are automatically entered into the annual Author Gift Certificate drawing. For more information on what might make it into the newsletter, check our Story Guidelines.